I created my first page for that scrapbook album cover I shared with you earlier this week (posted right below this post). You can find all the details for it over at the JustRite Inspiration blog here. This week's JustRite Friday Challenge is to make a scrapbook page with JustRite's stamps ... and just for doing so, you could win a $50 JustRite gift certificate! We hope you'll join us this week! Hello, friends! Today I have a 6-inch photo album cover to share with you over in Ellen Hutson's the CLASSroom, using one of Karen Lockhart's darling Window series of stamps in a little different way! I hope you'll join me there for all the details! Looking at this photo of my girls, I have to share with you what my darling oldest 10-year old said to me yesterday, on my birthday: "Mommy, I wish you were younger so you'd be around longer", LOL!! Oh my!! I *think* there may have been some love hidden somewhere there in her statement! They DO say the darndest things, don't they?!! Maybe I should make this album into a "Cute Quotes from my Kids" album ... I sure would have enough to fill an entire book!! Did you know JustRite Stampers has a photo gallery over on Flickr? It's a great place to find a bunch of JustRite project inspiration all in one place! Anyone can add their photos to the gallery and we would love it if you would! You can find it here: JustRite Projects on Flickr. Just for adding your JustRite projects to the gallery and for becoming a member of our JustRite group there, you could be randomly chosen to win a prize! You can read all the details about this little contest over on the JustRite Inspiration Blog today. It's a 6-inch square card ... I couldn't bear to cut up any of this gorgeous Webster's Pages Petites paper! And yes, a few of you emailed me to ask about seeing this card on the JustRite homepage -- yes, this was mine, thanks for your kind comments! I was very honored to have it featured there! I stamped the floral image and separate sentiment with Memento Rich Cocoa ink onto Neenah Natural White cardstock and colored with Copic markers. The image was die cut with Labels Nine Nestabilities, sponged and popped up on foam tape. The image is accented with crystals and pretty pink silk May Arts ribbon. Makes for a quick & easy card! We're trying to hurry Spring along over at theJustRite Stampers Inspiration blog today! We hope you'll join us and use some of your floral JustRite stamps for our Friday Challenge this week -- for the chance to win a $50 JustRite Stampers gift certificate! You can find all the details of my card there today. I hope you'll have some fun with this challenge this week -- you have until next Thursday to enter. Have a wonderful weekend! Can you tell I'm LOVING my new airbrush compressor and going to town Copic airbrushing anything I can?!! With an unlimited supply of air now, I've gone nuts! I hope you'll join me today in the CLASSroom, to see how I created this canvas wall hanging! With not feeling well last week, I didn't get a card made for JustsRite's Friday Challenge 005: Birthday Bash before now, so here it is! You also still have time (until Thursday morning at 9am CST) to make a project and enter it for the chance to win a $50 JustRite gift certificate! This birthday card uses my small Bingo card download in black. I spelled out WI*SH with JustRite's Brayton Uppercase 50-point font and inked up the letters individually with different Memento Dew Drop ink colors and stamped them onto my Bingo card. JustRite's Birthday Wishes center was stamped with black ink and die cut. Taylor's Tiny Twinkles red gemstones accent the sentiment and Free space! Distressed October Afternoon paper was machine stitched to a red card base. Have you ever wondered about Copic's Airbrush System or an Air Compressor to use along with it and the markers? 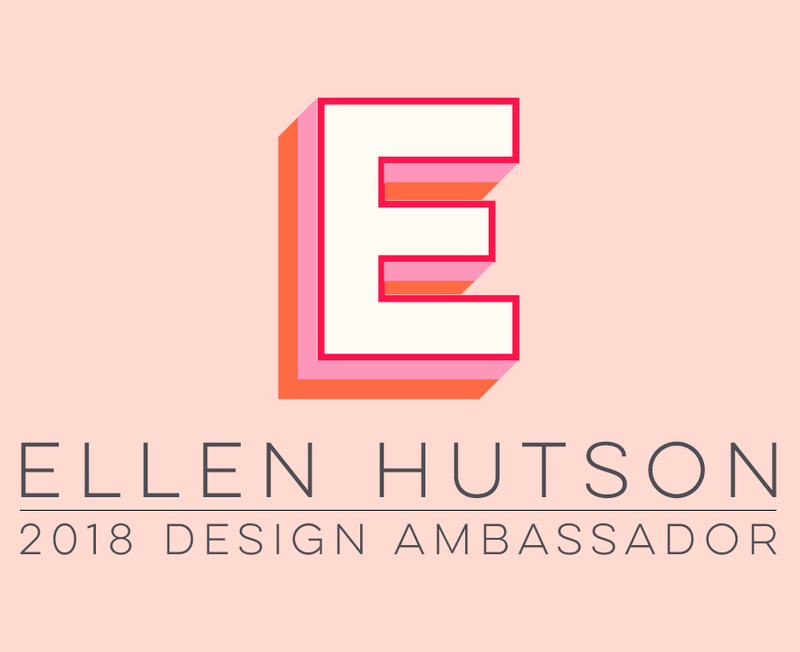 In Ellen Hutson's InTouch Newsletter that should have arrived in your inbox early this morning (I can't believe it's the 15th already! ), I try to ease your fears about Copic Airbrushing! I also walk you through the quick & easy setup of the Air Compressor Copic recommends for Airbrushing with their Airbrush System, and created the airbrushed Crystal Clear Plastic overlay frame shown above. If you did not receive Ellen's monthly newsletter (which always includes a special discount coupon code! ), shoot me an email and I'll hook you up! Then you can sign up to receive future mailings by visiting the pretty new homepage of her store here. Just scroll to the bottom and enter your email address where it says "Join our Mailing List". Then, over the next several weeks, I'll be sharing more Copic Airbrushing tutorials and projects on Thursdays over in Ellen's the CLASSroom, so I hope you'll join me! I'll be back a little later today or tomorrow with my project for JustRite's Friday Challenge -- a Birthday Bash! We hope you'll play along with us -- there's a great prize up for grabs! I couldn't let the holiday get by without making some Valentines for my best sweethearts (my girls)! Karen Lockhart's newest stamp additions were absolutely the perfect choice, I thought! The image was mounted with foam tape to an Inchie Arts Inchie Notecard (peach/pink variety pack) which is 3.50" square -- makes for a cute, quick & easy Valentine! The bottom of the notecard was accented with Martha Stewart's Valentine paper, cut with Fiskar's Apron Lace border punch. The mailbox was cut out and mounted with foam tape to a sweet heart shaped doily I found last year at the Target Dollar Spot. It's backed with more Martha Stewart Valentine paper and adhered to a Memory Box Cranberry notecard, cut down to 4.25" square. Papertrey Ink tied Hibiscus Burst buttons finish it off. I hope you all enjoy your Valentine's Day tomorrow! I hope to be back with another project tomorrow, but we'll see how the day progresses as I've been sick all week -- ugh! Ha -- that's my youngest crouched down behind Joe, holding out her arms! So, on to some Copic announcements. Below is a list of upcoming Copic Certification classes. You can find out more about the Certification program HERE. If you are interested in any of these classes (or other locations), CLICK HERE and fill out the electronic form to be added to our database. Thanks and I'll be back a little later with an update of my recent Copic storage solution acquisition! Sewing on papercrafting projects is all the rage! It can create added interest and unique effects to your cards and scrapbook pages. I hope you'll join me today in the CLASSrooom for a few sewing techniques, hints & tips for your papercrafting! It's been raining for more than two days straight here and I felt like I needed a little breath of Spring today! This birthday card was quick and easy and uses JustRite's new Breath of Spring violets/forget-me-nots, coordinated with some of my favorite October Afternoon paper! The birthday sentiment is from JustRite's Just A Note set. It was stamped, punched and tied with twine. A little Cuttlebug embossing grounds the flowers and completes this card! I hope it puts a little Spring into your day! Finally, my February calendar is done . . . I've been lost without it! I think this year I'm going to make a smaller version and use some 4-inch coasters I've had forever. This smaller version will take up a little less space on my desk than my previous 6-inch version (we can all use extra space, now can't we?!!) and will be a little easier to mail off to Grandma, too! The printed calendar I created is sized to fit Spellbinders Labels One die #4 perfectly (I'm sure it will fit any number of other shapes, too) and is available for download on my Tutorials & Downloads page HERE. You can find all the details on how I created it over at the JustRite Inspiration blog today, as I made it for the JustRite Friday Challenge 004: Crafty Calendars! So create your calendar and enter it for a chance to win a $50 JustRite gift certificate! Remember, you still have until 10pm CST tonight to enter for the chance to win a set of Copic Spica glitter pens (on THIS post), like the ones I used to color this cute JustRite floral heart! JustRite Stampers is sponsoring the CPS #152 sketch this week and I made this sample for it. You can find the sketch over at the CPS blog and enter your card for the chance to win a brand new JustRite stamp set! The side "V" panels were machine zig-zag stitched to the card and the JustRite images popped up on foam tape. I thought this card would make a nice birthday greeting for a sweet friend whose birthday is today!